LG's flagship flexible OLED is a beautiful, ludicrous, but ultimately delightful television, showcasing some fantastic tech. When LG hinted that it was going to go big on OLED in 2015 it certainly wasn't lying: with its 2015 line-up threatening to finally make OLED a thing we can all look forward to getting to know. The Korean giant has worked assiduously to make itself market leader with a technology that seems to have existed forever without ever dipping its colorful toe into the mainstream mass market, and it could just finally be bearing fruit. Last year's OLED line-up was limited enough to keep the cynics smirking, but LG's announcement that it will be producing OLED TVs across a broad range is manna from heaven for those who have been advocating the brighter, more vivid and previously ludicrously more expensive organic tech. Sitting at the top of the range is the 77-inch LG 4K OLED EG9900 which comes with a very particular gimmick of its own. With a wave of the remote you can take this beautifully designed television and make it bend or flatten depending on your need. 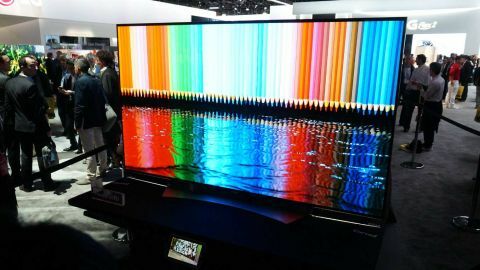 In reality, this is not likely to be the television that defines LG's OLED 2015 plans - it's going to be a pricey number with all of that technology inside, and the real headline act is at the lower end, where curved, 4K and OLED televisions will finally be at a price point that will be somewhere between aspirational and attainable. That dose of realism does not in any way undermine the crazy gorgeousness of the EG9900. As you would expect from OLED at this resolution, the screen is droolworthy - colours bright and vibrant, the blacks absolutely perfect. That's down to the technology, where OLED allows for pixels to be, effectively, turned off. That black isn't an interpretation of black, it's the absence of any emitted light. That 4K resolution means that you can be stood a matter of inched from the screen and only just make out the pixels. Standing back in the sweet spot, the glory of all that color is there to behold. This is where it's usual to drop into talk about the deep reds and bright yellows, but the most appropriate cliche is that you have to see it to believe it. The greatest possible advert for a 4K OLED television is to stand in front of it and soak it all in. But what of that flexibility? A press of a button moves the screen from a huge curved television into a flat screen. The movement is nice and our LG rep was adamant that no amount of flexing the screen will damage those OLED pixels - although that's something that only time will tell of course. Let's face it, there's a better than average chance that you simply won't be able (or, more honestly willing) to fork out the amount of money that the LG EG9900 costs, and that's before we even know exactly what that price tag. But in the meantime we'll go back to drooling over the screen quality and soaking up that color.